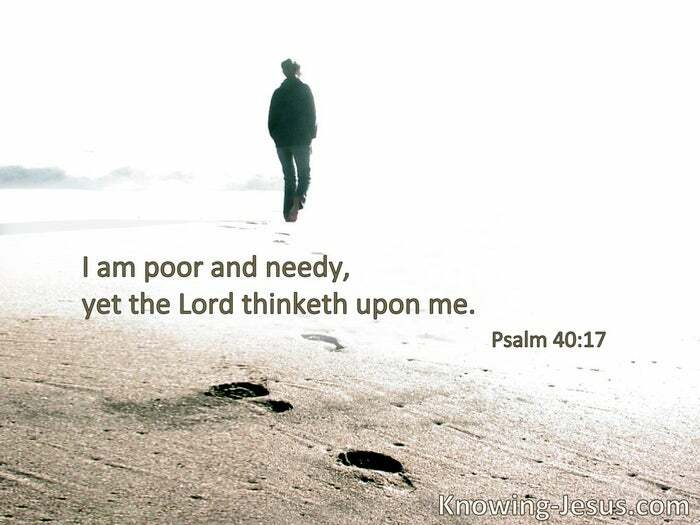 I am poor and needy; yet the Lord thinks upon me. How precious … are Your thoughts to me, O God! How great is the sum of them! If I should count them, they would be more in number than the sand; when I awake, I am still with You. § O Lord, how great are Your works! Your thoughts are very deep. § Many, O Lord my God, are Your wonderful works which You have done; and Your thoughts toward us. Not many mighty, not many noble, are called. § Has God not chosen the poor of this world to be rich in faith and heirs of the kingdom? § Having nothing, and yet possessing all things. § The unsearchable riches of Christ.